EAST LONDON, South Africa -- A South Africa surfer was recovering in hospital yesterday after being attacked by a monster shark – just hours before the movie Jaws was being rebroadcast on national TV. The shark, believed to be a Great White, shattered Lee Mellin’s surf board and left a 15-inch wound down his thigh in the attack at Bonza Bay. “The doctor said I’m the luckiest shark attack victim he has ever seen and I definitely agree,” said Mellin, 37, pointing at his bandaged left thigh yesterday. Speaking from his hospital bed, Mellin said it was his “survivor’s instinct” that saved his life. He remained conscious throughout the attack and yesterday gave a vivid account of his encounter with the Great White – even though it all happened “within a split second”. Mellin and his friend, Leigh Stolworthy, were riding the waves at about 8:45am on Saturday when they saw this “big fish” close by. “It obviously gave one look at Leigh thinking he didn’t have enough meat, so he went at me. “It was a flippin’ big thing. “ I was still on my board and it came for me. “I think the shark’s teeth got stuck in the surfboard. It then took another bite, but by then I let go of my board. “It all happened in … seconds. “Afterwards we got onto our boards and paddled back. They rushed to the hospital where Mellin was taken into the operating room for stitches. Mellin, who has been surfing most of his life, said it was simply a case of being at the “wrong place at the wrong time”. Stolworthy said he was also “lucky to be alive”. Mellin’s surfboard was bitten in two and teeth marks left on the two parts were evidence of the size of the shark. The two surfers think the shark was about 10 feet long, and Mellin reckoned the dorsal fin was about 16 inches tall. Buffalo City marine services chief Siani Tinley said it was likely the shark was a Great White but tests on the teeth marks on the surfboard and Mellin’s wound would confirm the species. Tinley added that the clean and cold seawater was conducive to Great White feeding conditions. 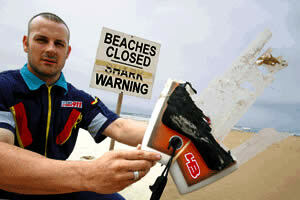 Bonza Bay, Nahoon and Gonubie beach were closed with shark warnings on Saturday, but re-opened after 8am yesterday. Both Mellin and Stolworthy told of seeing sharks before but they had never had a close encounter. However, they agreed they will soon be back in the water – surfing, of course. The Steven Spielberg movie Jaws is about a US resort being forced to close its beaches after a Great White attacks bathers. Hope he heals up well, but it's still frustrating to see these articles demonizing sharks. A large pitbull is not a "monster", why is a Great White? What a story! Lucky is right. A large pit bull that bites someone is a menace. I believe they are using "monster" as a description of it's size not demonizing the fish. I think the story is to the point and more about this mans lucky and unlikely survival and isn't bias one way or the other. Although the water was clear, 8:45am is definitely feeding time. Try surfing when the sun is high. Hello gobal friends, don't tell its a story and biased situation, when I read I really Hats of my friend Lee Mellin, who went back to south Africa for his Surfing hobby. I am really glad to God he is Luckiest Man in the world to survive with such encounter attack. People only can since who gone through such things. All the best for ur hobby. I feel so bad for you. I would probably be dead if I were in that situation. I would be crying so hard. I am only 12 years old and I would hate that so much. I went to Mexico and went in the ocean and was afraid sharks were going to come and get me. My uncle said it was alright. I didn't believe him thought. Anyway, I hope you are getting better. :)!!!!!!!!!!!!! Since I saw Jaw, I can't swiw far in the sea. When I was in Australia in 2000 the family I lived at had a boat and we used to go out in Sydney with the boat mostly in Sea Forth. Even though every body was swimming happily I couldn't take the shark idea out of my mind. That people get attacked is very crazy. You survived!!! You have a second chance! Good Luck! I think that Mellin is really lucky to be alive and way to get on the board again. I think that saying the shark is a monster is true, a pit bull never killed a human, sharks have! an interesting story you share for many others that have seen the movie jaws and/or have heard or not heard of other shark attacks. Like a previous commenter mentioned, watch for signs of sharks, and just be careful in your later times of surfing. Other than that, I have read that grey white sharks only attack what they think is prey, they aren't out to just attack every human that goes in the water. Just be careful, and keep doing what you love to do. OK, this storie has just worsened my phobia, guess the water wont see me sometime soon. Hope you have recovered. Bru ! Loose some weight so the next time he pop's up he'll go for Leigh's leg or keep feeding him surf boards. Close one bro but just not your time. Get well soon bru and we'll see you back in the water. wow it seems as if u were in the jaws movie! if i was u i would punch him right in the gill!!! thats what your suppossed to do! Yea, i was in the water one day when a great white poked its head up right next to (about 15 feet away) in front of me. I wasnt really scared until i realized what it was..i initially thought it was a seal just becuase of the width and dark color but three seconds later it clicked and i was paddling back to shore praying to god this thing didnt come from underneathe seeing as i was still abot 30 yards from land..its easy to say that i might have been mistaken by what "poked" its head out of water but i just remember getting those instincual feelings of "im in trouble" and "that was NO seal". a lot people get right back into the water after something like this but im going to take it as a sign and stay out for a bit..
wow. that looks very gross. I was just doing a little research on sharks. You are very lucky to be alive. That is amazing...and going back into the water is completely INSANE, but I give him lots of credit. WOW OUCH!!!!! I FIND IT AMAZIN THAT YOU ARE STILL ALIVE I FILL GREATFULL AND NO AFENCE BUT ITS A BIT INSANE THAT YOU ARE GOING BACK IN WATER ARE YOU EVEN ALOUD WITH YOU LEG BUT GOTTER GO SO I WISH YOU THE BEST OF LUCK IN WATER. When i was attacked by the great white shark i was really horrifed and scared. Congrats for making back to beach alive from your encounter w/great white & that you could get to hospital before bleeding out. Your survival instincts saved you; lesson for others is to keep composed & be ready to fight back. At least you had some warning that shark was there, most victims never see shark stalking him nor the initial strike. Surfing is such a great sport, hopefully you'll be back in water soon. It's just like falling off a horse; you just need to get right back on! I've been surfing since 1960 & have had a few encounters here on northerast coast of US with sharks. My closet encounter was with a huge great white. While surfing alone, all of a sudden I had this overwhelming feeling that I wasn't alone. I should have taken that as a sign to get out of the water right then. But the waves were huge & perfect, so I paddled back out. The great white charged at me in the trough between waves and just by luck did I survive it's attack. The sea belongs to its creatures. Surfers know they are taking risks. 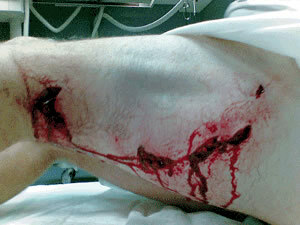 I admire those who go back to surfing after a shark attack. My family lives in Reunion Island where shark attacks are increasing for unknown reasons. Removing the sharks from the waters is not the solution. Don't want to be attacked? Don't go in the water, otherwhise, assume the risks of your endeavours in life!